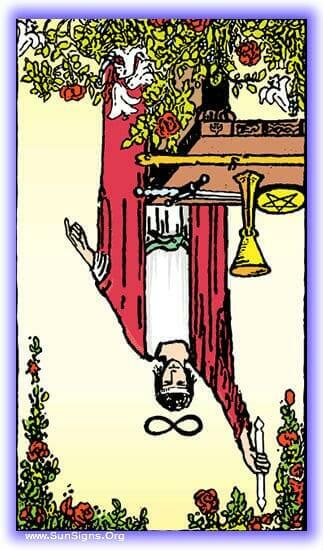 The tone of this Magician card in reversed meditation is unrealized potential, creativity, unhappiness in our craft, or just a lack of direction. Once you have the environment conducive to an uninterrupted meditation, place the card in front of you, light the incense and candle, and take a few breaths to center. Rest your eyes upon the card, taking in it’s imagery without truly attempting to ‘see’ it. You will feel yourself fall into the card as your focus comes to fruition. Visualize yourself entering a workshop, alchemical equipment bubbles and hisses violently on one side, it’s purpose forgotten. The tools that lay round are rusted, forgotten, in some cases covered with a layer of dust. In this place you will find the Magician unrealized. It is difficult to place the nature of this place, as the Magician has no part of himself in it. There may be partially completed works, all showing a lack of care, a lack of any real ambition. Perhaps you will observe the same theme over and over again, or it will feel ‘plastic’ and artificial. You may find him as an artist sitting on a stool, lazily and moodily drawing brush-stroke over brush-stroke over someone else’s work. Or performing data entry with the dull heartless eyes of the uninspired. The Magician reversed here is in a sort of personal hell, all of his hopes and dreams unrealized. But he knows he is full of it, look carefully. Are there sketches full of loving detail to be found, in stark contrast to the heart put into his ‘great work’, is there something outside the workshop doors that represents where he’d rather be or what he’d rather be doing? You may be able to draw him out, to speak to him, but know that he is in a great malaise, a permanent state of his heart being somewhere else. If you can find that spark, that topic, he will explode into great energy, speaking with fire and passion about that which truly inspires his soul. He may have a message for you, or perhaps it is hidden in his shop. Look carefully, for in this place all things become drab and dull, inspiration is repressed and stunted, and the fire of the soul can fail. If this is a place you feel yourself in, look for the secret to why, among the various detritus of the repressed work man’s shop. If you have a tarot journal, take notes on what you observed, record your feelings and emotions in this place, and what stood out. Pay special care to note anything that left you feeling dragged down and exhausted, and that which inspired you, if such a thing was. Within those are likely to be found messages for you.